Back in 2013, the market was very different regarding bumper plates and barbell. There were only few good options to purchase this kind of equipment such as Rogue and FringeSport. Back in those days, Fringe Sports had only limited options with much smaller sized inventory. I decided to give them a try and contacted them over a discounted Barbell, which was an original OneFitWonder Bar. It’s true that the bearing and specification wasn’t that good but the price was pretty much up to the mark. Fringe Sport color bumper plates have the abilities to be matched with anybumper plates available in today’s market. Having a construction of Virgin rubber, specifically for its long lasting durability, low bounce and density. The best thing by Fringe Sport that they are very much user friendly and only construct the plates the way user wants regarding its quality, These bumper plates made it into the best Weight Sets Review for home use because they are having an unbeatable extravagant combination. The company also gives you an option to make your set customize with the help of four fantastic bars and color bumper plates packages which are very budget friendly with one of the best deals in the market. The reason to choose bumper plates by Fringe sport is that because all bumpers are not created having equal specification an features but in Bumper plates by fringe sport you will have a feature of steel insert which is designed in such a way to perform much better than brass or steel bumpers. A steel insert has the capability to take much more gym abuse without chipping, clanging and malformation. Thereby, having exact tolerances it can fit with all high quality Olympic bars. Fringe sports bumpers are made up of thick beefy rubber which gives an ideal mix of high durability with certainly low impact bounce. Having too much bounce, makes the bumper plates potentially unsafe to use. Whereas the steel or Cast Iron plates, easily chip off an fall apart after a certain time. 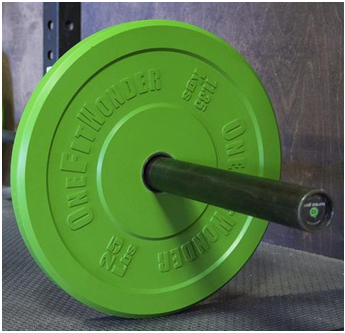 There are around five different bumper plates by Fringe Sport available in the market. Having a range from 10-55 pounds these bumpers plates are color coded which makes the weight easy to choose at a glance. Grey for 10lbs, Green for 25lbs, Yellow for 35lbs, Blue for 45lbs and Red for 55lbs weight plates. Fringe Sport bumpers are quite thinner and occupies less space on the bar, so you can add more weight without having a certain fear. 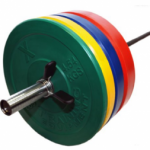 Having the same standard diameter it is easy to mix and match the bumper plates on your bar. Providing you such out-standing features and details, just for a user satisfaction guarantee plate just to make sure that the company is standing with its product. OneFitWonder gives a good range of Wonder bars at a great price and is considered best for any athlete or beginner. There are around four wonder bars launched by OnFitWonder having different specification and features. 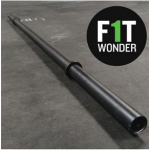 The Wonder Barbell by OneFitWonder is also known as bushing which is perfect for any home or regular gym user. This affordable priced entry level bar has all the features of every bar present on the market as well as Oly bars of Fringe Sports. Bomba V2 Barbellis the best value American constructed all round training barbell you can purchase. The second version of this bar was also created by OneFitWonder after listening to thousands of customer feedback. 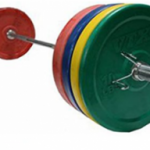 Olympic Barbell by Vaughn Weightlifting is the Vaughn bar which is specifically designed for aspiring Olympians. 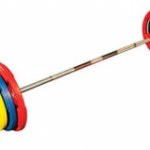 It is recommended for beginners and athletes to use Bomba Bar V2 or Vaugh Bar, because of their specifications. 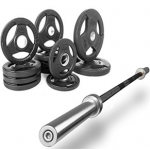 The Wonder Bar, Bomba Bar V2, and Vaughn Bar all comes with a Weight Sets Reviews of 20kg for men and 15kg for women. Women’s hands seems to be smaller than of men’s, so the women’s bar have a shaft diameter of 25mm as compared to men’s which is 28-32mm. Have a weight tolerance of 1% above or below declared weight. Insert Diameter of 2 inches on all plates. Overall in my opinion, the weight set by OnFitWonder is not really perfect but will definitely fit the bills. I choose them over Rogue was because of their weight tolerance of 1% above or below mentioned weight Sets Reviews 2018 . Whereas the 10lbs and 265lbs. was exactly up to the mark but after that from 35-55 lbs. it wasn’t really good enough and made my expectations pretty much down. There was a decrease of up to 2% on these plates which was really shocking thing to see. The pair comes in boxes which are taped together and the boxes are in pretty much bad, rough shape. Though the bumper plates weren’t affected by that but the plates were quite slippery at first, maybe it was because the paint and its smell was quite less and low. After working with them for several days in my garage, the slipperiness of paint vanished and so does the odor. Sleeve Specs 16” length and 2” diameter. 16.25” length and 2” diameter. 16.5” length and 2” diameter. 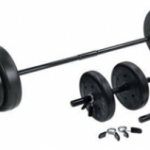 Provides a good range of weights sets and barbells. 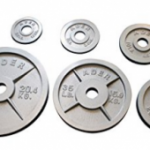 Very durable because of steel and Virgin rubber used in barbell and weight plates. Good choice for professional weight lifters and beginners. Gives a one year warranty on 10lbs and 3 years warranty on remaining weight plates. Weights comes with a smell of a certain chemical or paint. Few plates aren’t perfectly molded together.